Yoga is not about achieving or “nailing” any particular pose. The poses you resist are the ones you need the most. Feeling frustrated? That’s just your ego talking! If you practice the poses you dislike every day, you’ll learn to like them. Phrases like these tend to pop up whenever we yoga people talk about poses we’re frustrated with or just don’t particularly like. And while I think some of them do have merit (after all, yoga is not about nailing any particular pose, and I probably will like wheel more if I practice it regularly, as opposed to only when I have to), they’re often about as helpful in the moment as being told to “calm down” when you’re stressed out. If I start thinking about these bromides in the midst of a seemingly never-ending eagle pose, I’ll probably just berate myself for not being “yogic” enough to be unattached to the pose or for not quelling my (apparently) massive ego—thereby topping off my sense of failure with a heaping helping of yoga guilt. With time, and much trial and error, I’ve learned that (as is the case for everyone), because of my individual body structure and proportions, some asanas come easily and others are a struggle. In my case, forward bends and most hip openers and arm balances tend to be a breeze—backbends and twists not so much. As a result, I generally want to practice the poses I’m “good at,” and avoid the ones that challenge me. The problem, of course, is that this isn’t exactly the recipe for a well-balanced practice. So this is where creativity comes in—as I figure out how to make a pose that doesn’t feel good in my body feel good enough that I can experience its benefits, rather than gritting my teeth and praying for it to be over soon. This might mean discovering and applying a new cue or two, using props to create a more accessible variation of the pose, or choosing another asana that has similar benefits. While most of us probably don’t dislike the very same poses, I hope the preps and prop hacks that have helped me make friends with my least favorite poses will inspire you to make friends with yours too—and, if you’re a teacher, to help your students do so as well. For years, in every led ashtanga class I attended, I silently and desperately prayed to the teacher, Please skip parivrtta parsvakonasana, please skip parivrtta parsvakonasana. Sometimes I’d even avoid going to an ashtanga class I’d have otherwise enjoyed, opting instead for a home practice so that I could avoid revolved side angle (okay, and maybe also janu sirsasana C). The reason this pose is so challenging for me probably has something to do with my tight calves, which make it difficult for me to keep my back heel grounded while going fully into the twist. And for a long time, I found it challenging to keep my breath steady in that deep twist (which, FYI, is a solid indicator that you need to back out of the pose). Preps: With parivrtta parsvakonasana, a big game changer for me was the realization that I could swap it out for a revolved prayer lunge (with my back heel lifted and back leg in a neutral position). With the back leg largely out of the picture, I was able to explore the twisting aspect in greater detail—learning to breathe comfortably in a twist, while gradually bringing my bottom hand to the floor outside my front foot. One of my favorite ways to come into a revolved lunge comes from one of my favorite teachers, Annie Adamson (and she explains it in greater detail in this article and video). From a lunge with your left foot forward (back knee down or lifted, as you prefer), bring your left hand to your hip, and reach your right arm straight up alongside your right ear. Keeping your torso vertical, hinge forward about halfway (think 45-degree angle), maintaining a long spine. Next, bend to your left (but don’t twist). Once you’re in the side bend, begin twisting to the left, bringing the back of your right rib cage around to the front and hooking your right elbow outside your left thigh. By coming into the pose this way, I can breathe much more steadily and comfortably, which allows me to explore deeper variations (like binding) without feeling panicked (or like I’m dying to get out). When you can breathe steadily and comfortably in the more basic twist, you might then begin to explore other elements of the pose, such as bringing the bottom hand to the floor outside the front foot, or grounding the back heel. Props: I love elevating my bottom hand with a block in this pose. I also find that elevating the back heel with a yoga wedge helps to accommodate my tight calves. If you don’t have a yoga wedge, you can try rolling up the back edge of your mat to support your heel (as pictured), or pressing the outer edge of your back heel into the wall for more stability. Although I really like most hip openers (I adore pigeon, fire log, and frog pose), bound angle pose has always been a struggle. Even as a child in ballet class, I would often become frustrated when I couldn’t get my knees anywhere near the floor in “butterfly stretch,” as my seemingly more flexible classmates could (not that knees to floor is the aim of the pose, but back then I thought it was!). And years later in yoga class, same thing: My knees were always way above my hip creases in baddha konasana, and the pose felt awkward and uncomfortable—like it just didn’t work for my body. Preps: As much as I dislike the traditional form of bound angle, I love practicing a wide or extended bound angle (known to some as one variation of tarasana, or “star pose”). In this pose, the leg position is similar to that of baddha konasana, but with the legs less bent and the angle of the knees greater than 90 degrees. I think of it as kind of a cross between paschimottanasana (seated forward fold—a pose I love) and bound angle. If you’re a fan of paschimottanasana, chances are you’ll like this pose too. Having the feet farther away from the groin naturally lowers the knees and may allow you to find more comfort in your hips and greater length in your spine as you fold. As in the classic baddha konasana, you can hold onto your shins or ankles or use your hands to open your feet like a book (keeping the pinky-toe sides of your feet together on the floor) as you fold forward from your hips, maintaining a long spine. You could use this pose as a prep for or alternative to a classic baddha konasana. For example, you might practice a wide bound angle first and then come upright to experiment with scooting your pelvis a little closer toward your feet, finding an angle that feels comfortable for you to work with. Props: Sitting on a blanket is the standard modification when the knees are significantly higher than the hip flexors in baddha konasana. But my pelvis tends toward a bit of an excessive anterior (forward) tilt, and sitting on a blanket just encourages me to exploit that overtilt (without making much of a difference elsewhere). So, while propping oneself up on something can be a fabulous modification for some yogis, it’s not my favorite. Thankfully, there are other options! When I practice baddha konasana, instead of elevating my seat, I prefer to elevate my feet, placing them on a yoga block at its lowest height. This option brings the feet closer to the height of the knees, leveling the playing field (so to speak). From here you can work with your optimal variation of the pose, remaining upright or folding forward with a long spine. Those with tight-ish hamstrings often find boat pose a perpetual challenge, but it was my hip flexors that made me dread long holds in this pose. If, for whatever reason, you find holding navasana to be a struggle, here are a couple of possible variations. Preps: Although it may seem an obvious alternative, don’t underestimate the power of a bent-knee boat, which can serve as both an excellent preparation for paripurna (full) navasana and as a first-rate alternative. I especially love holding onto the backs of my thighs in this version (using my hands to widen them apart), which helps me to re-establish the natural curve of my lower back and facilitates more lift and length in my torso. Props: Once you find your ideal balance point, a strapped variation of navasana can feel truly delightful. Begin by making a big loop with a yoga strap (you may need to adjust it along the way in order to accommodate your proportions). Slip the strap over your head and snuggle it under your armpits, keeping the clasp or buckle in front of you so that you can easily adjust the size of the loop if needed. With the back of the loop against your shoulder blades, place the soles of your feet into the front of the loop, adjusting the strap so there’s no slack and you can straighten your legs. Press both your upper back and your feet into the strap, allowing your legs to straighten. Reach your arms forward and lengthen through your spine as the strap “hammocks” you in the pose. Finding your balance may be a bit of a challenge at first, but once you do, navasana might just feel effortless! With the added support of the strap, the hip flexors won’t have to work so hard. You can use this as an opportunity to consciously “ungrip” them and to activate your deep, transverse abdominals for support (by engaging between your frontal hip bones) as you continue to lengthen through your spine. 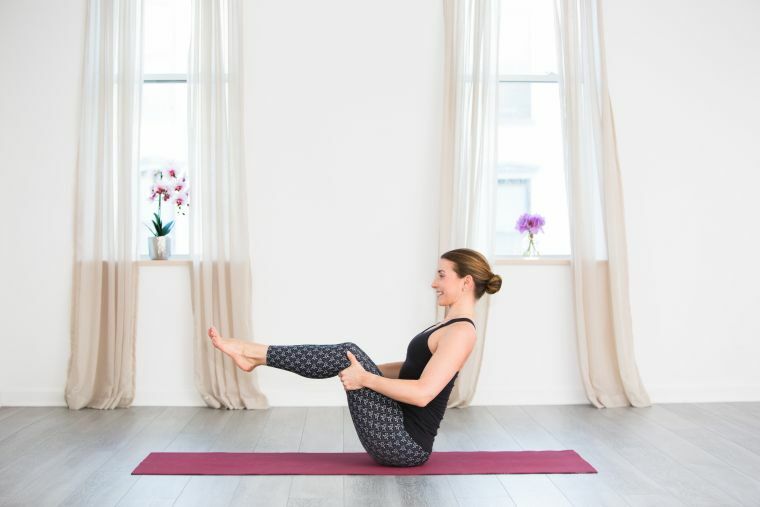 For me, “un-gripping” the hip flexors and consciously activating the deep abdominals has been a great habit to adopt, and I’ve found supported boat to be a lovely place to practice it. Internal rotation (of the thighs) has never been my forte, and I’ve never been crazy about one-legged balance poses to begin with (the foot cramps!). So eagle pose has always held a special spot on the list of “poses I’m not so fond of.” But even though my YI writer’s bio lists garudasana as my very least favorite pose, the following tips and tricks have helped me to sort of, kind of like it. Preps: Eagle tends to be much more pleasant when I’ve first done a few outer hip stretches and simpler balance poses. I think an especially nice preparatory pose (which can also be a great eagle alternative) is a standing figure-4 (sometimes called “standing pigeon.”) This pose combines the elements of a lateral hip stretch and a one-legged balance, but omits the internal rotation and the shoulder stretch. As such, it’s a wonderful starting place, allowing you to add the other elements of garudasana bit by bit. Props: This one is for fellow foot-cramp sufferers (or anyone who struggles with balance poses). Place a yoga block (at its lowest setting to start) just outside the foot of the leg that will be your standing leg. Bend your knees as if you’re coming into chair pose, cross your other leg on top, and rest the ball of that foot on the block. You can stay here as you organize your arms (and then practice the entire pose this way), or you can come into a traditional eagle pose and simply let the block be there if you need it. The block offers a lovely reprieve if your standing foot begins cramping up, or if you start to lose your balance and need a moment to recalibrate. While on the whole, arm balances are my favorite types of poses, peacock is by far my least favorite arm balance—in part because my proportions (long torso, short limbs) make it hard to position my elbows for optimal support in the pose. 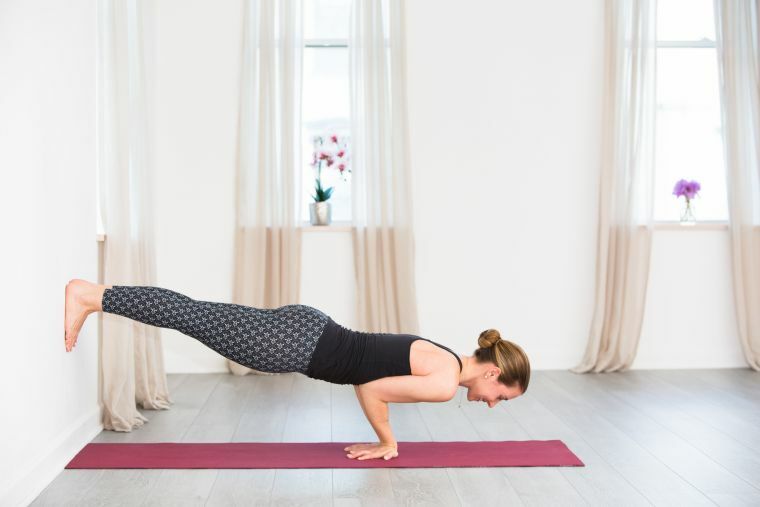 To quote one of my favorite teachers, Sandra Anderson, from her excellent article on mayurasana (which offers a complete tutorial): “Mayurasana is typically more difficult for women, whose center of gravity is lower than men’s. Anyone with heavy legs and short arms will have to work much harder to lift the lower body, since the center of gravity will not be over the elbows.” Why yes, that would be me. 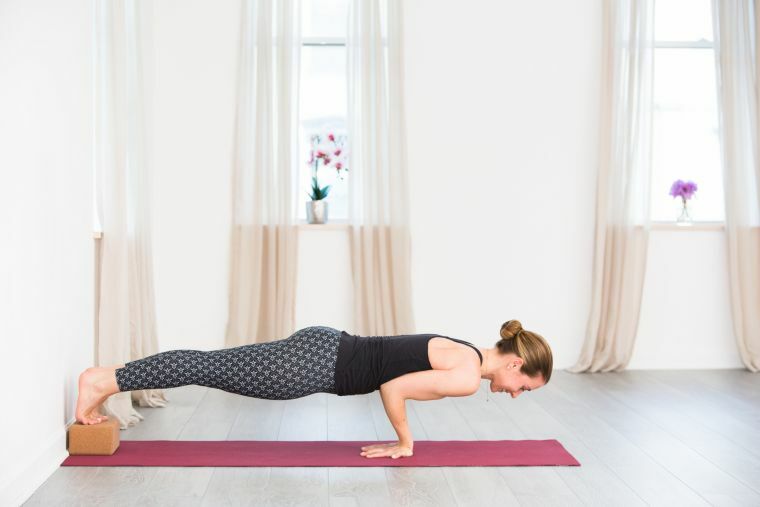 If it sounds like you too (or if you have other reasons for feeling less than ecstatic about mayurasana), the following preps and variations may help. Preps: Because we yogis spend so much of our time on our hands, with our fingers pointing forward in wrist extension (tabletop, downward dog, upward facing dog, plank, handstand), turning the fingers to point backward (as in peacock) can feel challenging, and even awkward. And then to immediately add a ton of weight-bearing and balancing into the mix? It’s a lot! Prep for peacock by reversing the direction of your fingers in poses such as table, cat-cow, upward dog—or even in a simple “fingers pointing down stretch” at the wall. Props: Those of us who struggle to balance in peacock pose with straight legs are often instructed to practice instead with legs in padmasana (lotus). This doesn’t work for everyone, though, as lotus can be inaccessible for a variety of reasons. (Though if lotus legs are a no-go, you might find you enjoy practicing with baddha konasana legs!) Another (lotus-free) alternative is to practice the pose with your feet on a block or the wall. If you have both handy, you might even try using a block and the wall. Come onto your hands and knees, pointing your fingertips backward and placing them about where your heels were. Decide whether it feels better to keep your wrist creases relatively parallel or to snuggle the pinky sides of your hands together. Slide your knees away from each other (letting them go super wide), bend your elbows, and lean forward—bringing your elbows into your belly, as low on your body as you can. You may keep your head lifted, or gently rest your forehead on the floor or a block. From here, stretch one leg back behind you, placing your foot on the block or against the wall. If you’re using a wall by itself, place the entire sole of your foot against the wall. If you’re using a block, bring the ball of your foot to rest on the block. If necessary, come out of the pose and adjust your positioning. Once one foot is in position, reach your other foot back to meet it. Then, if your head is resting on the floor or a block, try lifting it. If you’re using a wall, press your feet into the wall as if trying to push it away from you! Do we, perchance, have any “least favorite” poses in common? If so, give these variations a try and see how it goes for you. But remember that everyone’s body is unique—and what feels great to one person may well feel awkward or uncomfortable to another. After all, yoga is the continual process of getting to know ourselves. It invites us to figure out what works for us and to set aside what doesn’t. And through the practice we also start to notice the ways in which we transform from one day to the next—perhaps discovering that variations that once worked well for us no longer do. Or even that we now look forward to doing poses we once dreaded!